Need a commercial painting contractor for your next Albuquerque commercial painting project? Whether you need to touch up a room or begin a new paint job from scratch, you can depend on Octavio’s Painting, LLC, to provide you with accurate estimates, quality craftsmanship and competitive rates. Our commercial painters are licensed, bonded and insured to perform your painting project seamlessly and in a timely manner. Find out how we can enhance the exterior and interior of your commercial space—contact us to speak with a commercial painting contractor in Albuquerque, NM and receive a FREE, accurate estimate on your project. We have the best price in town, GUARANTEED! Contact us for commercial painting: (505) 907-0772. We provide interior commercial painting services in Albuquerque, NM and the surrounding area using only the highest quality acrylic paints, which come in a variety of sheens, including flat and gloss, as well as any color. One of the wonderful things about new acrylic paints is that it is washable, allowing you to clean up and scuffs, marks or damage, which will keep your interior paint job looking nice for years to come. The high desert climate in Albuquerque is harsh on the exterior of your commercial building. Our commercial painting contractors provide exterior commercial paint services designed to enhance the appearance of your building and protect it from the elements. Many businesses prefer durable elastomeric coatings that seal stucco, staining and masonry, protecting them for years to come. We can help you find the right paint for you—just contact us for a FREE estimate. You’ll be amazed at how new wood stain can breathe new life into the exterior and interior of your business. Using special stains that seal your wood trim and decking from the elements, we give your trim a beautiful, warm glow that will be able to weather the harsh climate. We provide complete repair to your exterior and interior, including stucco repair services. From simple patches to a complete resurfacing of your building’s exterior, count on our experienced commercial painting contractors in Albuquerque, NM to make your building beautiful again. One of the best ways to preserve the life of your commercial flooring is epoxy floor painting. Epoxy flooring and refinishing durable, slip and stain resistant, and will increase the value of your commercial space. Elastomeric coatings are 4-5 times thicker than traditional paint and ideal for preventing the appearance of cracked or damaged stucco. Our Albuquerque commercial painters have the special experience and equipment needed to provide elastomeric coatings. Give your building’s exterior a facelift with power washing by our painting contractors! This is a simple and inexpensive way to enhance the appearance of your building. We also offer graffiti removal and scheduled exterior maintenance. 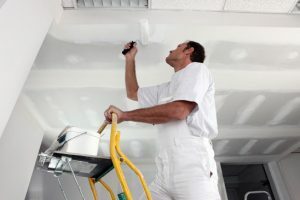 As local commercial painters, we have gained the trust of many business owners in Albuquerque, Rio Rancho and the surrounding area, including hotel and apartment owners. Contact us for commercial painting services in Albuquerque, NM, and get a FREE estimate today!